That will always amaze me. From those wonderful, shocking opening lines to the end, Ellen Foster is a completely absorbing novel, and the incredible thing is that Kaye Gibbons seems not to work at it. It all just flows straight from Ellen's strange young mind onto the paper and into ours. We know better of course. A writer puts in painstaking work to appear effortless. Yet Gibbons is also obviously a natural storyteller. Which in her case is the same as saying she's a natural creator of characters. For Ellen Foster's story comes from Ellen Foster; nothing is imposed on the character—nothing is given her to do or is put in the plot because it would be cute or would make for a dramatic twist or would make her more endearing to the reader. Rather it's the fully realized character of Ellen that insists on the dramatic plot turns and in a bizarre way endears her to us. Think of Pippi Longstocking or Anne of Green Gables or any of those other abandoned but plucky lasses of literature, who have become models of empowerment for young girls. Then forget them. They're fantasy. Ellen's the real deal. Open hearted. Scarily hardnosed. Afraid and wracked with guilt. Mean and tricky. Idealist and pragmatic at the same time. It's the contradictions, the shades, that give her such reality in the reader's mind. It takes a great talent to make such complexity seem so simply right that we just accept it: it's just Ellen. And the whole novel's like that. Soaring and pathetic. Inspiring and heart-breaking. And just right. Once again, when speaking of Gibbons's work it's hard to avoid sounding mushy. But there's a difference between sentiment and sentimentality. Sentiment is messy, both good and bad all mixed up together, what we all go though in real life. Sentimentality is a greeting card. Gibbons doesn't do greeting cards. 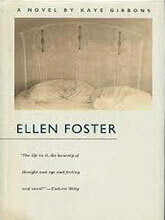 Ellen Foster is as tough as The Catcher in the Rye (a book it has been compared to, perhaps for the claustrophobic, single, young person's point of view). Tougher maybe. Ellen Foster is barely long enough to be considered a novel but it doesn't feel like anything less, presenting a depth and breadth that other novelists spend two or three times as many words to achieve. Nor is it a young girl's novel. Though every young girl and boy should read it. And then reread it as a grown-up woman or man to understand it all over again.